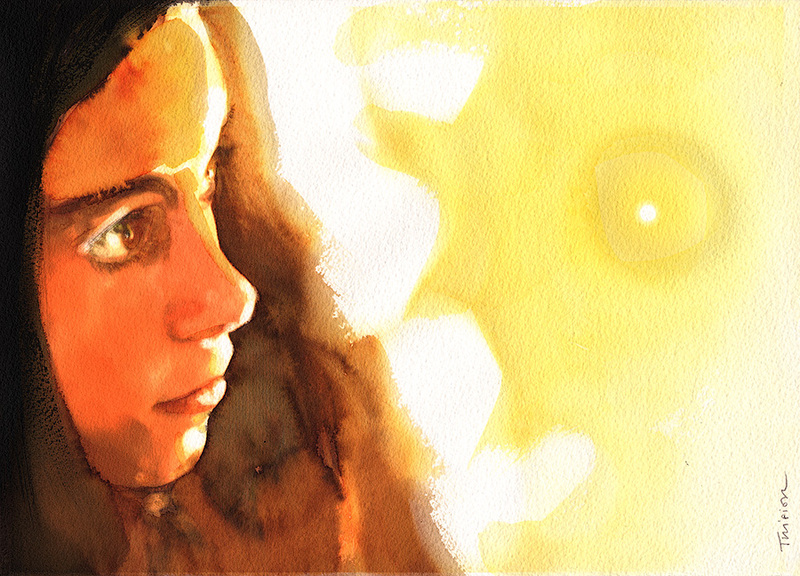 Here is a useful watercolor portrait technique to help you establish your composition and draw the eyes to the focal point you desire. The idea is to establish a triangle between you, the subject of the painting and that subject’s focus point. In other words -sometimes having your sitter stare away is the best way to draw attention to your subject. Here is an example of that portrait composition technique (watercolor portrait on Arches paper, 10″ x 14″). Brush strokes can help achieve a similar effect -note how a dry brush was used for the sitter’s hair on the left, whereas I used a wash at the right of the portrait, therefore going from defined areas and strokes to diffused ones. Also, you will see a dry brush used one on the face, right above the focal point I wanted to establish (right eyebrow, above the sitter’s eye and the lightest point on the face). Curves can frame a face in a way that is easier on the eyes -see the curve of the subject’s hair. I find that hair is the most useful framing parameter available to the artist when painting children and women. Texture helps -I use rough watercolor paper to contrast with the soft washes and overall painting technique. It’s a question of balance in the overall structure of they portrait and watercolor. You can read more about my watercolor techniques (including watercolor portrait technique and many examples) here.